I have been working with Auroville Papers based in Pondicherry, South India for nearly two years now and a result a very humbling experience. They pride themselves on the quality and creativity of their products which are also produced in an ethical way. They are renowned for making exceptionally gorgeous notebooks and sketch books made from cotton and vegetable fibres. The whole process involves no felling of trees which in turn helps to keep the surrounding biodiversity intact. Auroville Papers are an enterprise who gives their employees a clean environment,promotes their economic and social progress and encourage their creative capacities. 71% are women from surrounding villages. 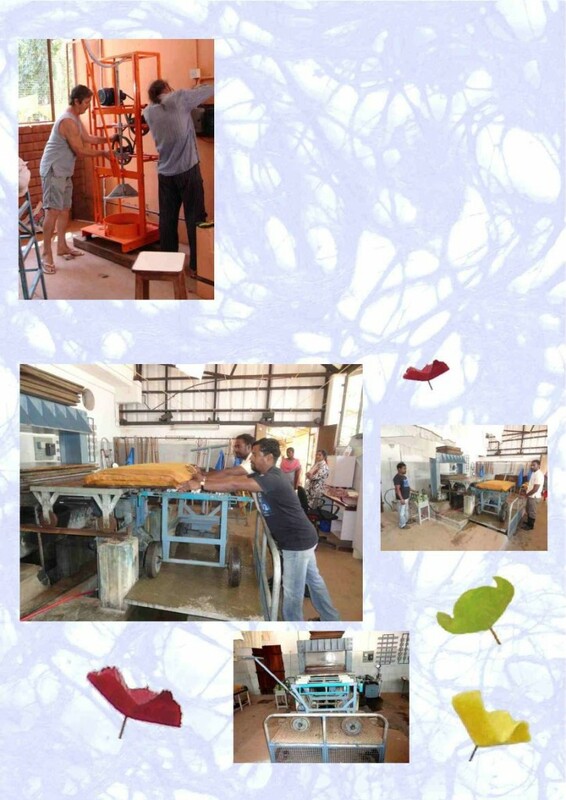 Over the years lot of steps have been taken to improve the working conditions for their employees. They were concerned about the fact that paper is heavy and handling of wet paper pulp is an extremely strenuous job. First they worked on the transport of the pulp.They modified the tables and chairs so that they are fitted with rollers. Now the workers do not have to lift tons of paper as the tables and chariots are on the same height. Second, they worked on their hydraulic press. Previously heavy paper had to be hauled up to the hydraulic press to squeeze the water out of the paper but now they have an elevator which works with a press of a button. Employees are the bedrock of the social enterprise and are looked after well. What I like most Suresh says,”is helping create new designs,like the painted leaf designs”. Suresh is one of the few employees who do not come from the surrounding village but who after marriage with a girl have settled locally as there are better job opportunities. As for Jagdish after working for a paint company, he felt much more comfortable making wonderful things out of paper. He has a better relationship with the management and keen to continue working for Auroville as long as possible. Sendhil used to work 12 hours shift in a stationary shop in another part of the town but now enjoys a great work life balance. The last paper maker, Kumar is proud to work for Auroville as visitors come from abroad and appreciate his work. The employees have becomes stars in their own right and are willing to learn and develop as time unfolds. Auroville is a centre for alternative technology in India. Natural earth-building methods have been developed to a great extent. Organic farming is thriving and the use of natural methods of manufacturing without the destruction of the planet are a hallmark of the Auroville community.